Dubai: From driving recklessly to endangering lives of others and sudden stops in the middle of the road, Dubai police said these are the most common offences committed by drivers during National Day celebrations. 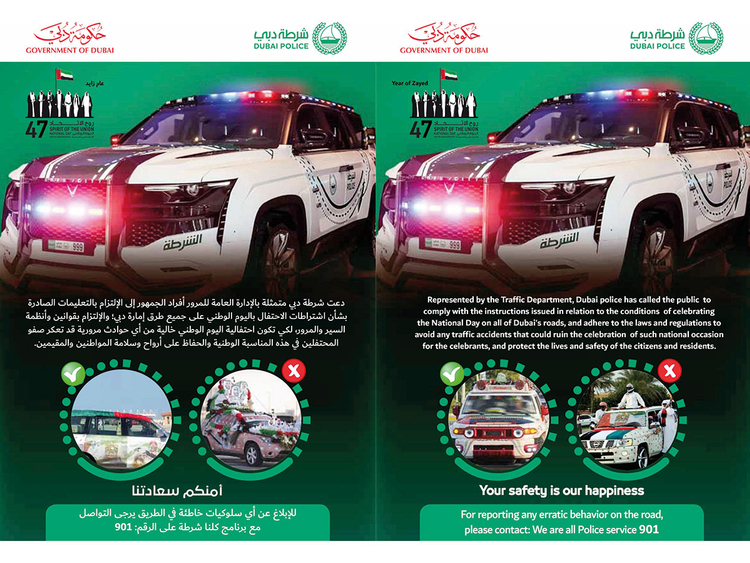 As the country gears up to mark the 47th National Day, Dubai Police have warned motorists that bad behaviour and dangerous car decorations will result in fines of up to Dh2,000 and 23 black points. Brigadier Saif Muhair Al Mazroui, director of Traffic Department in Dubai police, said police would be prepared during the national celebrations to nab offenders. Police patrols will be deployed on all Dubai roads, especially on major intersections to monitor the traffic flow. Mobile radars will be installed on highways and the areas of celebrations to crack down on violators. He urged the public to refrain from avoid creating chaotic situations on the roads and to abide by road rules during the celebrations of the National Day. “Bad behaviour and dangerous driving will result in fines of up to Dh2,000 and 23 black points and cars can also be impounded for up to 60 days,” Brig Al Mazroui said. People who go on rallies without permission will be fined Dh500 and four traffic points and vehicle impound for 15 days. He said that stopping on the middle of the road will result in Dh1,000 fine and six traffic points. Brig Al Mazroui, affirmed that Dubai Police will provide safety, security and comfort to all residents and maintain its reputation. He added that the Dubai Police are working to achieve high safety standards and enhance comfort on the roads by ensuring smooth traffic flow. Driving a vehicle in way endangering lives of road users, Dh2,000 fine, 23 traffic points and 60 days impound for the vehicle. Dh1,000 fine and six traffic points for stopping the vehicle in the middle of the road for no reason. Dh1,500 for exceeding permitted car window tinting. Dh500, four traffic points and 15 days impound for driving a vehicle in unauthorised march. Dh500 fine for writing words or putting posters on the vehicle without permission. Dh400 and four traffic points for using the horn or the stereo in way to annoy others. Dh400 and four traffic points for not following traffic instruction. Dh1,000 and six traffic points for throwing garbage from the vehicle. Decorate the car with flags or anything that doesn’t obscure the driver’s view or the car’s number plate. Don’t equip vehicles with noise-emitting mechanisms. Don’t obscure the number plate. Don’t stick body parts out of the windows or sunroof. Don’t write anything obscene or profane on the car.